SANTA CLARA, CA, June 4, 2018 – HALO Electronics, a global supplier of FastJack™ integrated Ethernet RJ45 connectors and discrete transformers, announced today its full line of 2.5G and 5G Ethernet transformers to address the increasing data rates of enterprise networking equipment and the higher bandwidth requirements of wireless access points. The 2.5G/5G data rates are an important intermediary step between the 1G and 10G data rates; offering increased data transfer over 1G using existing cable installs as well as lower power consumption per port when compared to 10G. HALO’s 2.5G/5G transformers are available in two packages. The NZ/NZ5 industry standard packages are available in standard temperature and extended temperature versions with PoE, PoE+,and 4PPoE (+90W) capabilities. In addition to the NZ/NZ5 package, HALO has announced the Nano2.5G series of miniature transformers. The Nano2.5G parts are available in PoE, PoE+, and 4PPoE (60W) options. The 2.5G/5G transformers are available through HALO’s franchised distributor partners. Production lead-time is stock to eight (8) to twelve (12) weeks. 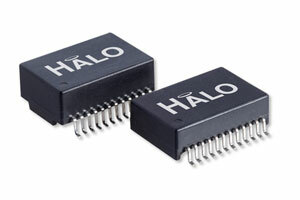 HALO® Electronics is a leading supplier of high quality communication magnetics including signal transformers, CMR chokes, PoE flyback transformers, DC/DC converter low power transformers, and Ethernet connectors. HALO’s leading-edge technology solutions are manufactured in ISO9001 and ISO14001 factories providing the highest quality products. This entry was posted in Press Releases and tagged ethernet, gigabit, isolation, rj45, transformers on June 5, 2018 by Matt.